Earlier this week you may have seen us bigging up stick twirler extraordinaire Steve Moore. His combination of wildly over the top movements, stick tricks and a rather fetching sparkly yellow jacket was pretty darn impressive. But, he's not the only one who can rock out behind the kit. Take a look at our pick of his rivals for the title of the world's most exuberant drummer. Ok, this guy may look as if he's about to keel over, but you've got to admit, he's whacking that bass drum (with what appears to be some kind of mallet) just about as hard as he can. Nothing to see here. It's just a guy doing a spot of busking outside a Japanese train station. Oh no, hang on, he's gone absolutely crazy! Hands a blur, legs stamping seemingly randomly on cymbals, even the cameraman's got into the spirit by falling over halfway through. 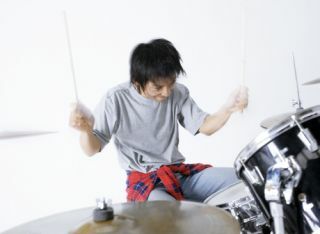 And here we have Korea's answer to Keith Moon. He may not be able to decide whether to sit down or stand up, but that seems to have little effect on his playing. Some drummers blend into the background when playing pop sessions. Not this guy. After a laid back start he soon makes himself known with an inability to sit still, some awesome facial expressions and plenty of over the top playing. When UK session ace Robin Guy is the most restrained drummer in a video feature, you know you've put together something special. Here you can see Robin bustin' out a typically energetic solo at last year's Jobeky Custom Drum Show.